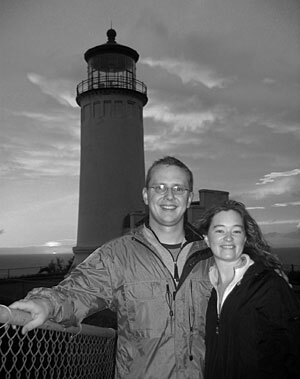 Steve and Amy visit another lighthouse! Steve and Amy Tanner live in Chicago, where among other things, they update SteveandAmySly.com with their thoughts and adventures. Married on the unique date of 02/02/02, the couple enjoys taking many trips, standing up for the uniqueness of Chicago by hating Macy's, and sampling new soft drinks every now and then. Steve serves as the Director of Web Operations for Kidology.org, a non-profit resource for those working in children's ministry. He's also the Editor of BevReview.com, a site dedicated to beverage reviews of non-alcoholic drinks. It wouldn't be surprising, however, to find him exploring the trash cans of Disney theme parks, documenting the lighted window messages on Chicago's CNA building, riding his bike, or enjoying a good game of Ticket to Ride. Amy, whose nickname "Amy Sly" was inspired by her maiden name of "Sylvester", is a Licensed Clinical Social Worker (LCSW). She currently works as a therapist at Cherry Hill Center in Lake Zurich, IL. With over 10 years of experience in working with children and adolescents around issues of grief & loss, attachment, anxiety, anger, social skills, understanding & overcoming childhood trauma, abuse, and neglect, she enjoys the diversity of helping others via private practice. To relax from her sometimes stressful and emotionally-draining occupation, Amy enjoys spending time with her friends (she is often guilty of grabbing a "quick" cup of coffee with her friends only to find out that 2 hours have passed), reading, and trying out new recipes in the kitchen when she's actually home at dinnertime. Keeping fit by cycling with Steve or working out are also great ways she maintains a balanced lifestyle. Together, Steve and Amy often hype their favorite place for ribs, Jack's Bar-B-Que in Nashville, TN. Their passion for Jack's is almost as strong as their love for Arena Football, where they (sometimes begrudgingly) support the Chicago Rush. For some odd reason, the couple enjoys exploring the idiosyncrasies of shopping centers, but that doesn't mean they don't have time to construct a LEGO set together. It's also their personal goal to visit all the lighthouses found on the western Great Lakes. The Tanners launched SteveandAmySly.com in 2001 to coordinate the details for their wedding, which included online RSVPs, e-commerce shopping registries, and a live streaming broadcast of the ceremony. After the big event, this website was converted to a blog format, where they continue to share their thoughts on topics that probably don't interest anyone else.